If you found out that one of your “friends” was secretly peeking in your windows at you and your family throughout the day, would that person continue to be your friend? Of course not. But that is exactly what Barack Obama has been doing to Israel. According to the Wall Street Journal, during Obama’s first term the decision was made to monitor the communications of Israeli Prime Minister Benjamin Netanyahu and other Israeli leaders. This represents an astounding betrayal of our closest ally in the Middle East, but the scandal doesn’t end there. In the process of monitoring Netanyahu and other Israeli leaders, the NSA also collected private conversations that they had with members of the U.S. Congress. So that means that Obama and the NSA were spying on Congress, which is a very serious violation of the law. This wasn’t supposed to happen. 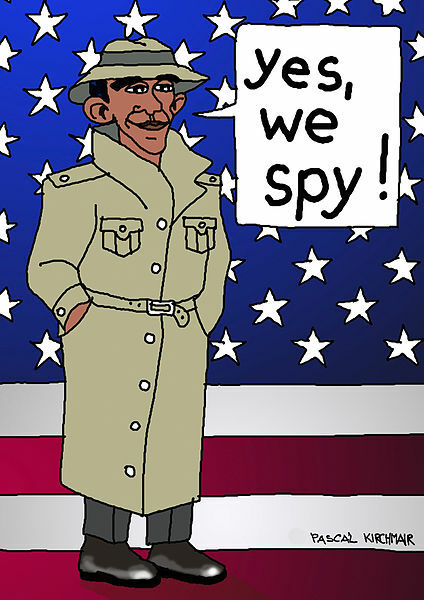 Two years ago, Obama promised that he was going to quit spying on the leaders of other nations that we are allied with. So when did all of this spying on Israeli officials originally start happening? The NSA began keeping tabs on the Israeli Prime Minister late in Obama’s first term in office. The surveillance was driven by fears that Israel was planning an attack on Iran. The agency carried on with its spying operations, and discovered that Netanyahu had leaked details of the Iran negotiations – which could have jeopardized the deal – and had coordinated talks with American Jewish groups. He also asked undecided U.S.lawmakers what it would take to win their vote. This scandal should be front page news all over the country, but this story is already starting to fade from the headlines. The way that we are acting is absolutely disgraceful. The “good guys” do not spy on their friends. Personally, I can’t understand why the American people are not steaming mad about this. No wonder the rest of the world is turning on us. We go around doing whatever we want and abusing our “friends”, and then we still expect everyone to love us. The NSA had, in some cases, spent decades placing electronic implants in networks around the world to collect phone calls, text messages and emails. Removing them or turning them off in the wake of the Snowden revelations would make it difficult, if not impossible, to re-establish access in the future, U.S. intelligence officials warned the White House. Instead of removing the implants, Mr. Obama decided to shut off the NSA’s monitoring of phone numbers and email addresses of certain allied leaders—a move that could be reversed by the president or his successor. There was little debate over Israel. “Going dark on Bibi? Of course we wouldn’t do that,” a senior U.S. official said, using Mr. Netanyahu’s nickname. The National Security Agency’s targeting of Israeli leaders and officials also swept up the contents of some of their private conversations with U.S. lawmakers and American-Jewish groups. That raised fears—an “Oh-s— moment,” one senior U.S. official said—that the executive branch would be accused of spying on Congress. Former Michigan Rep. Pete Hoekstra, who chaired the House intelligence panel from 2004 to 2007, called for a probe late Tuesday, remarking that the Obama administration had exhibited an “unprecedented abuse of power” if the allegations are true. Regardless of what happens in Congress (which probably won’t be much), the big story is what this will do to our already damaged relationship with Israel. By systematically conducting surveillance on Israeli Prime Minister Benjamin Netanyahu and other Israeli leaders, the Obama administration has shattered what little trust remained between the two governments. During his first seven years in the White House, Obama has already proven to be the most anti-Israel president in modern times. Everyone already knew that he greatly disliked Netanyahu and that he even sent many of his top campaign officials over to Israel to try to help defeat Bibi during the last election. But this scandal takes things to an entirely different level. Barack Obama has greatly betrayed Israel, and he isn’t even sorry for doing it. So how will the American people respond? Will they express great outrage and demand Obama’s resignation? In fact, this story will probably almost be entirely forgotten once the current 48 hour news cycle is over. We have a population that is so far gone that they don’t even understand that spying on our allies is very, very wrong. It isn’t just Obama – our entire nation is becoming a little bit more like Nazi Germany every single day, and hardly anyone even seems upset about the transition.